What I really hate is losing to the guy who is better at playing the game than me. Everyone knows who I’m talking about; he’s the guy who probably never drills, has probably never seen a manual, let alone read one. He’s good because he’s an athlete. He wins not because he is a better martial artist, and not because he has a better grasp on the sources. He wins because he is better at winning tournaments. He is better at the playing the game. For a long time, the only views I had regarding tournaments were negative. I thought they polluted the art. I thought they were silly. I thought the people competing in them had no idea how to fence in a so-called real sword fight. Having never really tested myself before, I thought I was pretty awesome. And then Longpoint 2011 happened. Part of that was pride. Part of it was a perspective that viewed tournaments as something that debased the art, that was nothing more than another form of sport fencing; HEMA without the H. And all of those things are or can be true to some degree or another. But most of it was just excuses. Of all the flaws I’ve encountered in competition, the most important ones I’ve discovered were my own. If I lose to someone who is faster than me, then I need to work on my timing. If I lose to someone who is playing “sword-tag”, then I need to work on my defense. If I can’t use tactics to beat the athlete who relies on his superior attributes to win, then I need to develop my understanding and ability to apply strategy and technique. 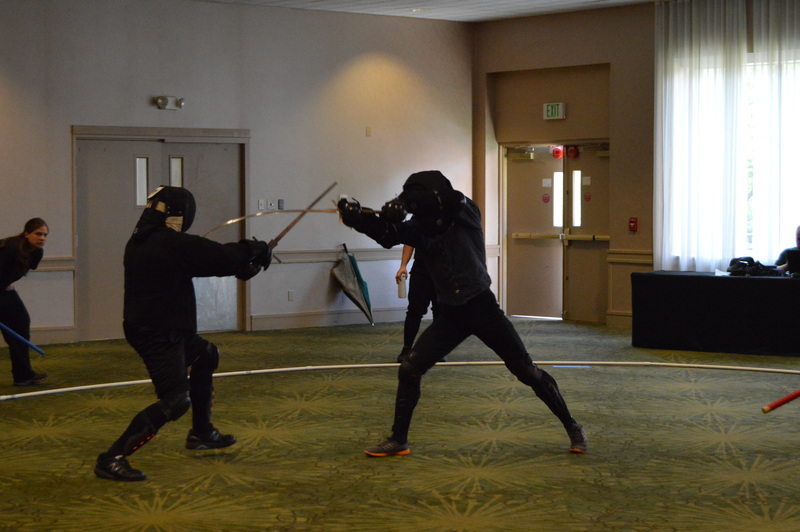 Tournaments are a game in which to test particular sets of skills; whether it is your ability to cut with a sharp sword, or perform techniques from the sources we study in a martially sound way that matches the text, or beat an antagonistic opponent in a fencing match. Does being able to do any one of those things by themselves make you a good martial artist? No. Does being able to do all of those things together make you a good martial artist? Not necessarily, but it puts you on the right track. Many people are afraid of tournaments in HEMA becoming the new sport fencing; a fun, athletic game where you score points with a sword-like-object under a certain set of rules, far removed from a supposed real sword fight. I was one of those people. Enough digital ink has been spilled discussing that topic, so I’ll only say this: rather than ruining my ability to train HEMA, competing has taken me further than I had ever gone before. Competitions drive me to train harder, work longer, and strive to be better than everyone else. They give me a dream and a goal to work towards. They are difficult, stressful, painful, and they are incredibly fun. They are also only a small part of what I do; I typically compete in 1 major competition, and 1-2 smaller events throughout the year. But training for those competitions is what gives me the drive to keep going when I feel burnt out. It pushes me to study deeper, train harder, and practice longer. A competition is not a real sword fight, but no less real than any other form of free fencing. Any convention you introduce, any variable you change, will alter the fight. Whether you add more gear or remove it, it’s not real unless the swords are sharp. But my goal is not to get as close to fighting with a sharp sword as possible. My goal is to better understand all aspects of my art. Competition never should be, and never will be my primary goal. It’s merely one part of the triangulation that is necessary in recreating HEMA. Competitions force me to constantly reassess, to reexamine, and to push myself instead of remaining complacent. They have taken my understanding farther than ever before. I’m a better fencer, a better martial artist, a better teacher, and even a better person. There’s a lot to hate, but there’s a lot more to love. About the author: David Rowe is a senior instructor with the Virginia Academy of Fencing where he has trained in various HEMA traditions since 2001 and taught professionally since 2005. His main area of focus is on the early Liechtenauer tradition of swordsmanship and the associated weapons, as well as medieval and renaissance Ringen (German wrestling) traditions. He is currently undergoing his graduate studies at Catholic University with a focus on transcription and translation of Medieval manuscripts. In addition to teaching at VAF, David has been invited to teach at various national and international HEMA events. Reblogged this on Scribbling in my car.